This Celtic necklace features 6mm Connemara marble beads and it is enhanced with additional Celtic beads that are silver plated pewter with oxidized accenting. 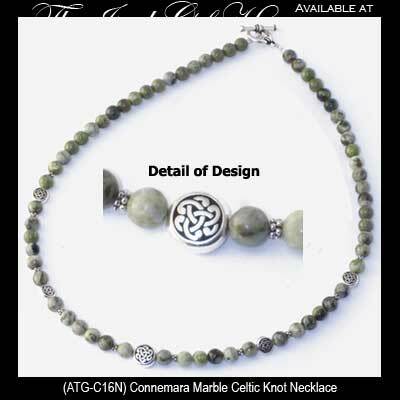 The Connemara marble necklace measures 18" long including the toggle clasp and the largest Celtic bead measures 3/8" round. Connemara marble earrings feature silver plated Celtic knots.